I placed in a major match for the first time ever. Fifth place, but placed! 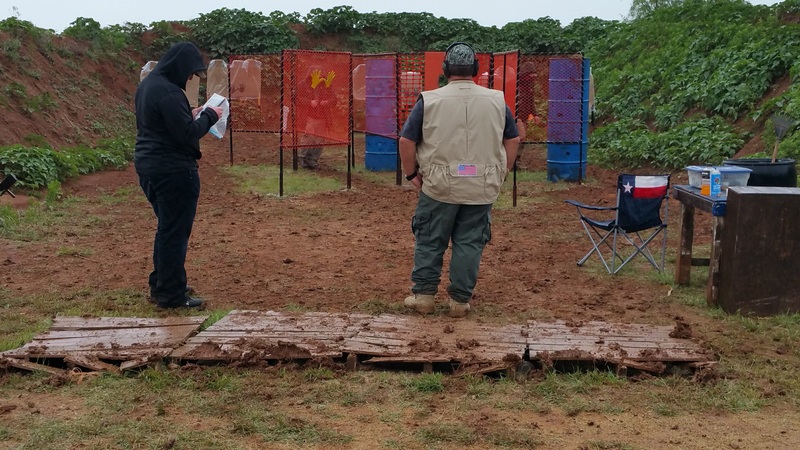 Regardless of the semi-miserable cold and muddy conditions, the pistol has a tiny bit of mud on the grip and the Polycase Inceptor ammo burns pretty cleanly. The ammo ran absolutely trouble free, too. As expected, there was a bit of conversation at the chrono table and mock resistance as they had a nice chart of common bullet weights and the minimum velocities required to meet power factor. There was not a chart entry for 97 grains, so a bit of math ensued. 1288 fps required; 1388 and 1401 achieved for 135 PF. It never really *rained*, but we had mostly constant drizzle from about 9AM until about 1PM. For me, the peak of misery was around Stage 12. 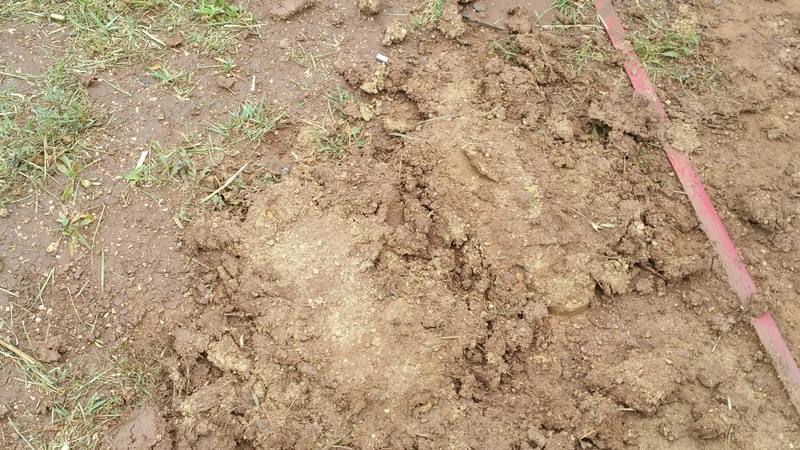 By then, no targets were dry, no tape would stick and every step added a pound of sticky mud to the bottoms of my shoes. The start position for stages is often marked with foot-shaped cutouts for the shooter to stand on. Believe it or not, there is a set of them in this picture. Match results were not too shabby, especially considering my recollection of my previous run at Silver Dollar in 2014. However, upon closer analysis, the 2014 scores were maybe not as bad as I remember. Raw and final times were actually similar, though the rules in effect in 2014 meant that it took 137 points down to be similar to only 80 points down in 2017. In any case, first wood is still first wood and I am very happy about it and the weather only made it more valuable. 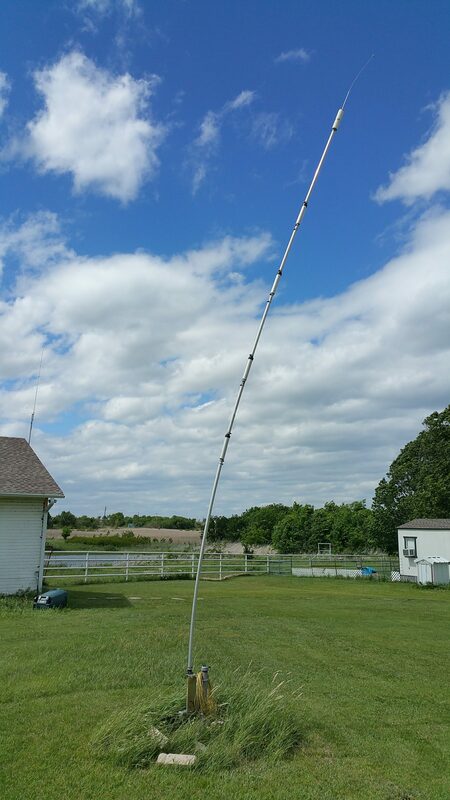 The rain was gone, but it was pretty windy on Sunday, too. 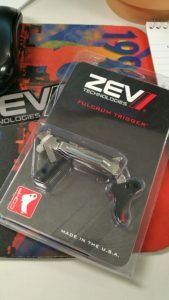 In preparation for Silver Dollar (and just because), I ordered a Zev trigger for my Glock 20. I ordered the Fulcum Professional Ultimate package, which is the non-adjustable version with all the related parts. It was hoped that it would arrive in time for me to install it and shoot in a local match or two before Silver Dollar. When it still had not shipped by the Thursday before the match, I contacted Zev about it. Turns out that they were backordered from their supplier on parts for the non-adjustable trigger. They upgraded my order to the adjustable version and credited the shipping charges. While it was the Monday after the match before I received the trigger, I ended up with the arguably better version for less money. It took longer to clean the gun before installing the trigger than it did to install the trigger. Well, unless you count the time spent looking for the tiny striker spring cup half that I dropped. It seems like it might be a good idea to have spares of those. The stock trigger on that particular pistol is/was well polished and broken in and had already been tweaked as much as possible, so the Zev trigger did not make much difference in the pull weight, 3 to 3.5 pounds. The new trigger does have a crisper release, a shorter reset and the trigger shoe itself is nice and wide and flat, so that 3 pounds feels like less. A lunchtime trip to the range on Tuesday revealed that it works very well. I have a new toy, er, tool. 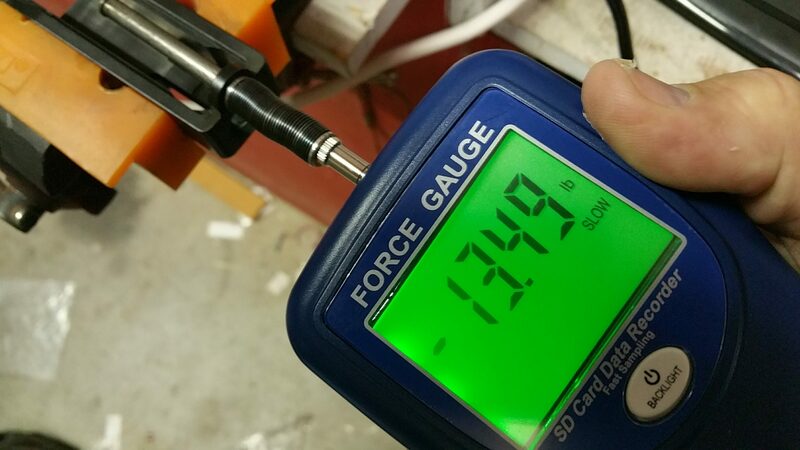 I have wanted a force gauge for a while. I have a couple of practical uses for one, but mostly I am just curious about everything and want to know. This one is a Reed SD-6020, a 20 Kg capacity force gauge. Anyone of a less scientific bent would probably call it an overpriced digital scales. 🙂 Due to what I can only call a fluke in the pricing structure at Amazon, this unit was listed at about $144 instead of the usual $535. The listing did not indicate that it was used, though admittedly, there was none of the usual new device additional packaging, like poly bagging around the device, and it had a battery installed. Doesn’t matter to me! The first practical use I have for it is to verify the weight of the recoil springs in my various pistols. For proof of concept, I took a quick measurement of the stock spring in my Glock 19. I used the hole in the front of the slide as a guide and pressed the gauge against the other end of the captive spring assembly. I found that just short of full compression, it read just under 16 pounds, which is about what was expected. I have not found a lot of really authoritative info about the stock spring specifications other than in the description of aftermarket parts. There does seem to be a consensus that 16 pounds is likely. 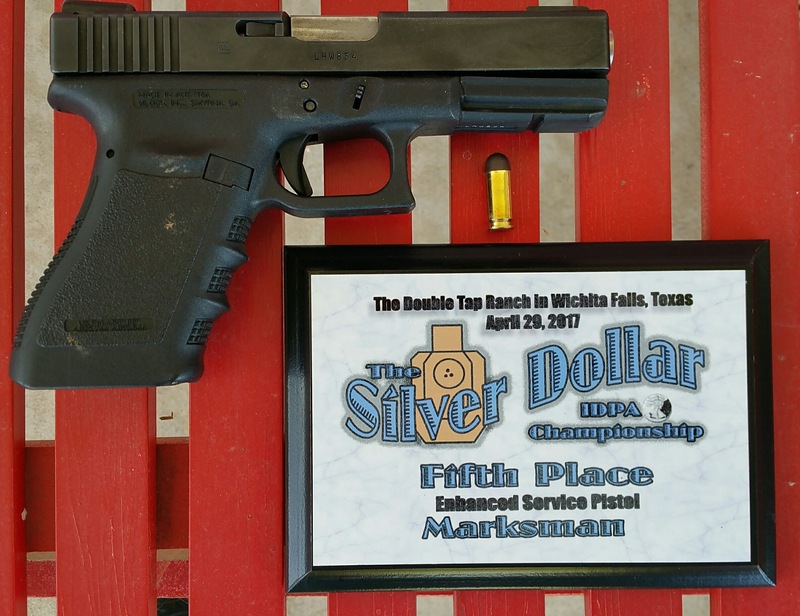 I could not remember whether the reduced spring I have been using in my G20C for low recoil 40S&W was the 11 pound or the 13 pound. Holding the slide in a rubber jaw vice freed up both hands to compress the spring, and after several attempts, I was able to compress the spring then carefully use my left hand to snap a pic without moving the gauge two millimeters and having the spring launch across the room. I took several measurements that ranged from 13.49 to 14.1 pounds. I presume those could be within expected tolerances of 13 pounds or maybe it’s really a 14 pound spring that was in the 13 pound package. It is definitely not 11 pounds. With the 11 pound spring, I may be able to experiment with ammo running less than 125PF, particularly if I want to tweak ammo for use in a BUG gun, assuming I can adjust my Kahr CW40 to comply with the new rules. In any case, I will locate and measure all the recoil springs I have. Expect a future post on the subject. Last Wednesday was the first Low Light match at Defender Outdoors and so far as I can tell, the first one at all since August 2016. Except for one stage which allowed a rail mounted light on a gun, I held my light in my left hand and shot strong hand only. There were a couple of misses, but generally, it was not a bad plan. Next Next post: First and… FIRST!